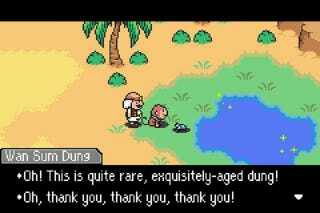 The people who translated Mother 3 to English say that if Nintendo ever wants to bring the quirky RPG to U.S. shores, the company can use their script. Free of charge. Writing on the Mother 3 fan translation website, translator Clyde Mandelin says that if Nintendo were to ever localize the game, he'd be happy to give Nintendo the English script they released on the Internet in 2008. Mother 3, you may remember, is the excellent Game Boy Advance sequel to Earthbound (which is called Mother 2 in Japan). Although Mother 3 never made it to the west, Mandelin and his team released a fan translation in 2008, and their script is great, full of wit and charm and ridiculous puns. Earlier this week, Nintendo announced plans to finally re-release Earthbound in the United States: they'll bring it to the Wii U's Virtual Console later this year. This has led RPG fans to wonder: what about Mother 3? Well, what about Mother 3? The chances of Nintendo localizing a Game Boy Advance game in 2013 are zilch, but some sort of digital release on the Wii U or 3DS eShop could do quite well for them—and earn some serious goodwill from RPG fans across Europe and North America. Nintendo would have to do far more than just swap in an English script, of course—localization is a time-consuming and expensive process—but fans sure would appreciate it. And I imagine a lot of curious gamers would want to know what the hype is all about.